Product #780 | SKU 3610-014-247 | 0.0 (no ratings yet) Thanks for your rating! Outfitted with a lens ring that emits a bright glow in the dark. 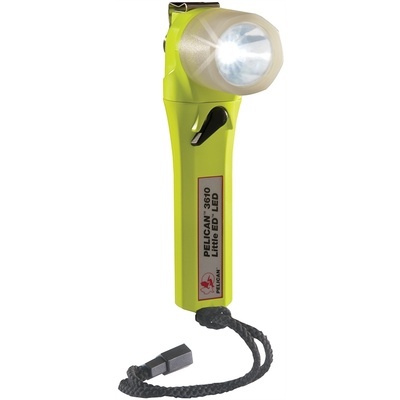 The Pelican 3610 Little Ed Right Angle LED Flashlight with Photoluminescent Shroud (Yellow) is outfitted with a lens ring that emits a bright glow in the dark. The new generation photoluminescent material in the plastic absorbs the energy from any light source - fluorescent lights, the sun, or even the flashlight's own beam. No more fumbling in the dark for your flashlight. The Little Ed 3610PL is powered by 4 AA alkaline cells (included).